On Wednesday, Senator Kamala Harris compared the U.S. Immigration and Customs Enforcement (ICE) service to the Ku Klux Klan, insisting that certain “communities” view the agency as a “domestic terrorist group” that deliberately uses “fear and intimidation” to specifically target “immigrants coming from Mexico and Central America” based on their racial or ethnic background. VITIELLO: Well, the Klan was what we would call today a domestic terrorist group. HARRIS: Why? Why would we call them “domestic terrorist group” [sic]? VITIELLO: ‘Cause they tried to use fear and force to change political environment[sic]. HARRIS: And what was the motivation for the use of fear and force? VITIELLO: It was based on race and ethnicity. HARRIS: Right.Are you aware of the perception of many about how the power and the discretion at ICE is being used to enforce the laws? And do you see any parallels? HARRIS: [interrupting] I’m talking about perception. I’m talking about perception. 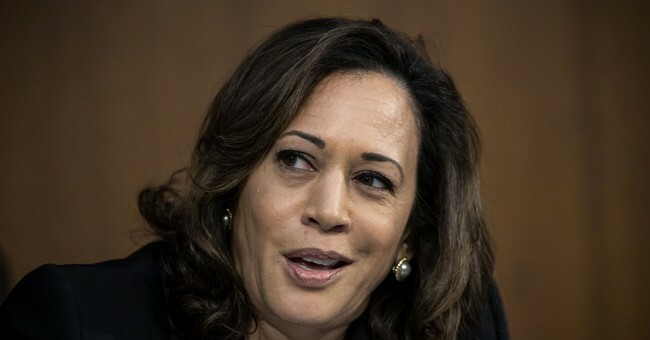 HARRIS: …So I want to return to the question that Senator Peters asked you about the statement you made describing the Democratic Party as “liberalcratic” or “NeoKlanist,” which was -- I think the assumption there was that you were comparing it to the Klu, Ku Klux Klan -- Klu [sic] Klux Klan, the KKK. So, you said in response to his question, you’re sorry because the words caused offense. So, would you not be sorry if no one was offended by your words? VITIELLO: No, it was wrong to do. HARRIS: Why was it wrong? VITIELLO: Because those are offensive words. HARRIS: Why are they offensive? VITIELLO: Because they have history in this country and, and -- I, I honestly didn’t mean it that way. After this brief back-and-forth, Harris then directly led the discussion towards her rhetorical questions about the supposed “parallels” between ICE and the KKK. SEN. KAMALA HARRIS: Thank you Mr. Chairman, and I’d like to emphasize your point. This is a hearing to determine who will be the next head of ICE, so this is about reviewing the perspectives, the qualifications, and the experience of the nominee. So, that being said, I think, Mr. Vitellio [sic], that you would agr- -- have I pronounced your name correctly? RONALD VITIELLO: Vitiello [pronounced “Vitello”]. HARRIS: I think you would agree as a member of law enforcement that law enforcement generally speaking —and certainly it would be the case with ICE officers and agents — that a great deal of your power is discretionary. You have limited resources and you make decisions about what you’re gonna do, but you exercise a great deal of discretion in terms of how you are going to use the limited resources and how you are gonna prioritize them. And then, understanding that, I think you would also agree that one’s perspective and their bias, if they have bias, will influence their exercise of discretion in terms of the power they have and how it will be used and implemented. So I want to return to the question that Senator Peters asked you about the statement you made describing the Democratic Party as “liberalcratic” or “NeoKlanist,” which was -- I think the assumption there was that you were comparing it to the Klu, Ku Klux Klan -- Klu [sic] Klux Klan, the KKK. So, you said in response to his question, you’re sorry because the words caused offense. So, would you not be sorry if no one was offended by your words? HARRIS: But please talk about the history. What is the history that would then make those words wrong? VITIELLO: ‘Cause they tried to use fear and force to change political environment [sic]. HARRIS: Right. Are you aware of the perception of many about how the power and the discretion at ICE is being used to enforce the laws? And do you see any parallels? VITIELLO: I do want to advocate for the workforce that the vital public safety mission that they have to protect the homeland [sic], and I think more people need to know how valuable they are to the society, so I agree with you on that.